Xiangtan JiangLu Precision Machinery Co.,Ltd,former holding company of JiangLu Machinery Group, specializes in design and manufacture of machines for powder metallurgy, and non-standard machines, including full automatic powder compacting press and carbon brush press, series of equipments for powder metallurgy, non-standard metallurgical machine, and high speed transmission for aerospace. 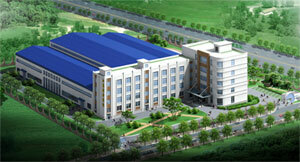 JiangLu is the leading company in the industry. FZJ160 full automatic powder compacting press won the Second Prize of the National Sci-Tech Advance Award in 1989; TZJ160 is the first carbon brush press in China which integrates the functions of lines feeding, pressing, and lines cutting; ZN-FZJ160 intelligent press is the leading manufacture of digital powder compacting press in China. Our products have been sold well in China and exported to USA as well. Take machining capability and technology of the Group as support, JiangLu strives to manufacture high precision equipments to serve and satisfy our customers by constantly making improvements with innovative ideas and technologies.